Betsey Johnson’s wacky personality and quirky fashion sense really show in the pieces she creates. We don’t often see the designer (unless it’s Fashion Week or something), but she was recently spotted attending the Power Women Gala held at the Grand Hyatt in New York. Betsey was a spectacle to behold at the event. While everyone was dressed in floor-length frocks, she was decked in something else — sequined leggings paired with a sequined blazer. On top of the flashy separates, she also decorated her outfit with bold leopard-print kicks, a matching tote, and a hot pink scarf. And then to make it even more interesting, she made playful poses on the red carpet, most likely for the benefit of the photogs. While we can’t find ourselves sporting the same extremely glimmering (and bold) outfit, we do find the hot pink scarf she wore quite intriguing. The color is gorgeous; and it has that silky sheen that makes it perfect for dressy occasions. We’re pretty sure it’s from her own collection, but unfortunately, we could not find it anywhere. 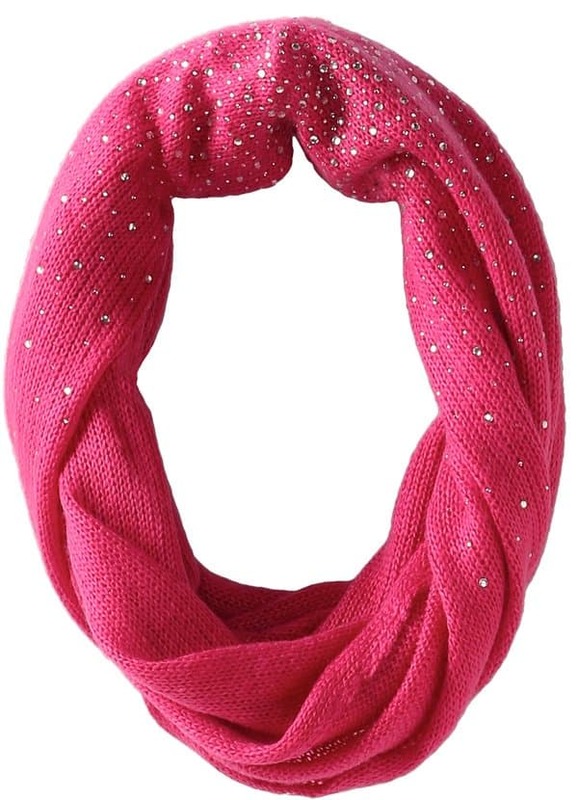 On a side note, we did come across this embellished infinity scarf at Zappos. It’s a knitted piece made of acrylic that is quite ideal for winter. It comes sprinkled with crystals for a dressier effect, though we highly doubt you’ll be able to take this one to an evening soiree. It’s just not made for that.